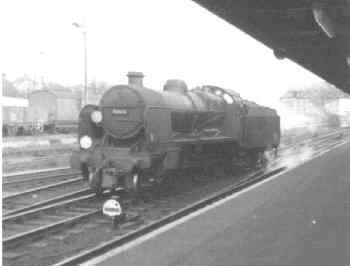 This scene is of more significance than it might at first seem, 34051 Winston Churchill is on Bournemouth shed after working Winston Churchill's funeral train. The area of where the shed stood is now a car park, and it is crossed by the bridge just visible at the top of the photo of a 4REP. This was taken from the same position as that of 34051 but looking east and shows an ex Southern Railway U1 class 31803 on one of the centre roads at Bournemouth Central station, as it then was as Bournemouth West was still open. 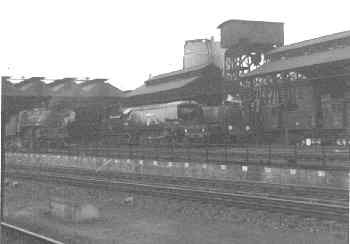 The approach to West station is still in use as the electric unit depot and carriage sidings. Next some photos by Nigel Kendal. 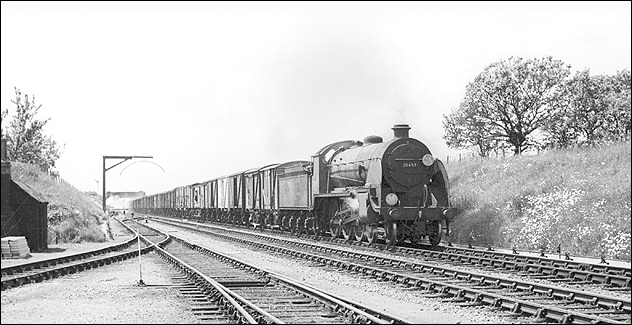 34056 Croydon leaves New Milton with an up semi-fast on 19th August 1966. 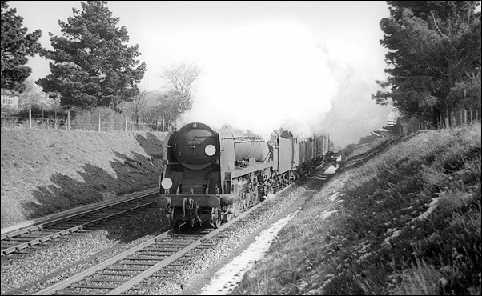 34046 Braunton descending Walkford Bank with a down Semi-fast. 5 March 1965. 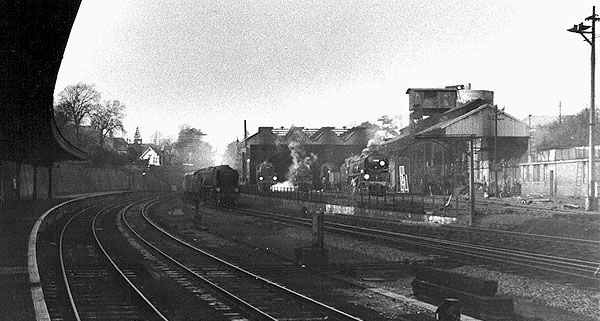 Braunton is in the process of being restored by the West Somerset Railway Association - see In Works. 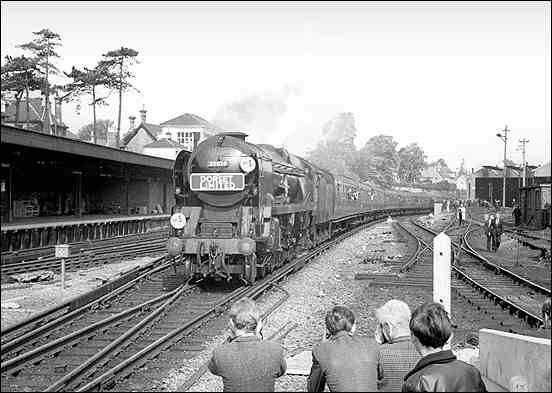 Merchant Navy Pacific 35030 Elder Dempster Line arriving at Bournemouth Central with an up special, the "Dorset Limited" organised by the Bournemouth Railway Club just a few weeks before the end of steam - she got to Waterloo in under the time allowed for the new electrics! On a late winter's evening in 1962 an ex-works 35029 'Ellerman Lines' simmers on Bournemouth Shed while a rebuilt West Country Pacific enters Bournemouth Central from the west. 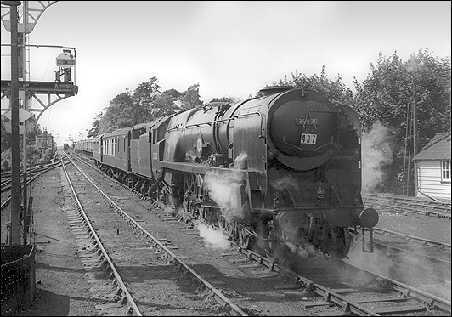 On a stinking hot Sunday in August 1962, S15 30497 tramps up through New Milton with a special freight from Weymouth to Bevois Park. 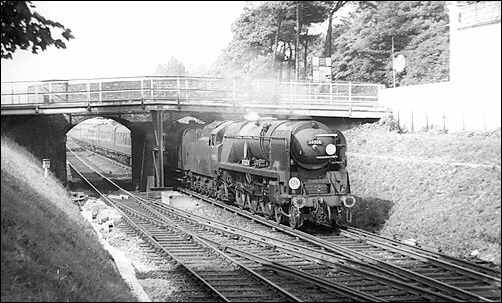 A sure-footed, and pristine, Nine Elms Merchant Navy 35020 'Bibby Line' pushes the 'Bournemouth Belle' out of Bournemouth West and through the washing plant on a summer Saturday in 1962. Photos not otherwise credited are ©2001-2003 S G J Huddy. Other photos are included with permission of the copyright holders.